Ever thought of doing an SIP in Gold? Or investing in a gold ETF without a demat account? If so, then we have the solution for you. The Quantum Gold Savings Fund (QGSF). QGSF invests in units of Quantum Gold Fund - Exchange Traded Fund (QGF), which in turn invests in physical gold. Investors can regularly invest in gold by investing in QGSF through small amount SIPs. You can also invest in QGSF without holding or opening a Demat account! 1. Helps diversify your money in gold, an important tool for diversification. 2. Enables investments in gold through SIP or STP of as little as Rs 500/month. 3. Does away with the need to open a demat account as is the case with Gold ETFs. 4. Does not suffer from gold-related problems like storage and theft as the fund house takes care of all risks of storage and safety for a minimal expense ratio. 5. Ensures quality of gold is up to the mark as it invests in Quantum Gold Fund where the gold is sourced from London Bullion Market Association approved refiners. What is Quantum Gold Savings Fund or QGSF? Fund of Fund is a mutual fund scheme investing in schemes of other mutual funds. Quantum Gold Savings Fund - QGSF is an open ended Funds of Fund scheme that invests in units of the Quantum Gold Fund (ETF), which in turn invests in physical gold. It is an ideal investment vehicle if you do not have a demat account and want to invest in Gold ETFs. The Quantum Gold Savings Fund also provides investors with a simple way to regularly invest in gold through Systematic Investment Plans. You can invest through the regular investment process without holding or opening a Demat account. • QGSF gives Convenience through SIP facility. Systematic Investment Plan (SIP) allows you to start investing in the Quantum Gold Savings Fund for as little as Rs 500/- per month. SIPs help you to invest in a disciplined manner and thus generate wealth over the long term. • QGSF helps to diversify your investments across third asset class which is GOLD other than Equity and Fixed Investments or Bonds. • QGSF takes away your worry about quality of Gold as it invests in Quantum Gold Fund where the gold is sourced from London Bullion Market Association approved refiners. • QGSF takes away your worry about storage and thefts as the fund house takes care of all risks of storage and safety for a minimal expense ratio. What is the Investment Objective of the Quantum Gold Savings Fund? The investment objective of the Scheme is to provide capital appreciation by predominantly investing in units of Quantum Gold Fund – Exchange Traded Fund (QGF). The performance of the Scheme may differ from that of Quantum Gold Fund and the domestic prices of gold due to expenses and certain other factors. There can be no assurance or guarantee that the investment objective of the Scheme will be achieved. What are the different features available under Quantum Gold Savings Fund? Systematic Transfer Plan (STP):This feature enables an investor to transfer fixed amounts from their accounts in the Scheme to another scheme within a folio from time to time. Where will the Quantum Gold Savings Fund invest? What is the Current portfolio? The AMC uses ‘passive’ approach to try and achieve the Scheme’s investment objective. The Scheme would predominantly invest in the units of Quantum Gold Fund. Quantum Gold Fund which is the underlying investment of this Scheme endeavors to track domestic prices of gold by investments in physical gold. Click here to view the current portfolio of the Quantum Gold Savings Fund. What is the Benchmark of the Quantum Gold Savings Fund & Why? The scheme’s performance will be benchmarked against the price of physical gold in the domestic market. The Benchmark has been selected as the Scheme being Fund of Fund scheme predominantly investing in Quantum Gold Fund – Exchange Traded Fund investing in physical gold. Therefore, the aforesaid benchmark is most suited for comparing performance of the Scheme. Who is managing the Quantum Gold Savings Fund? What is the Minimum amount I need to invest or redeem in the Quantum Gold Savings Fund? How do I invest in the Quantum Gold Savings Fund? What is the current expense ratio of the Quantum Gold Savings Fund? The current expense ratio of the Direct Plan of the Quantum Gold Savings Fund is 0.06% p.a. and the expense ratio for the Regular Plan is 0.18% p.a. with effect from June 01, 2018. Effective 01 Dec 2018, the base TER has undergone a change, however the Total Expense Ratio remains the same. "As per Regulation 52(6)(a) of SEBI (MF) Regulations, the total expenses of the Scheme, including weighted average of charges levied by the underlying schemes shall not exceed 2.50% of the daily net assets of the scheme"
What are the entry and exit loads for the Quantum Gold Savings Fund, why does it impose an exit load? What are the different options/facilities available under Quantum Gold Savings Fund? Can I hold the units of the Quantum Gold Savings Fund in Demat mode? 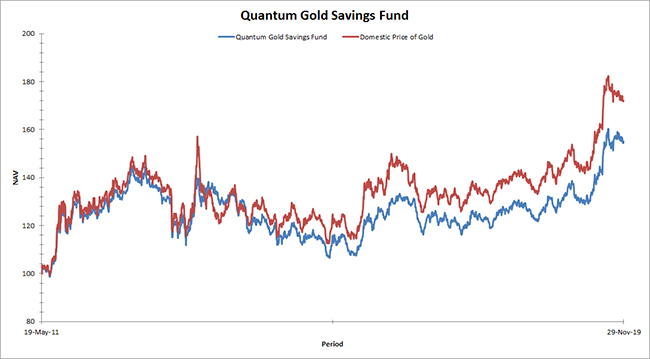 How has the Quantum Gold Savings Fund performed? Tell me more about the NAV applicability and cut-off timing of the Quantum Gold Savings Fund. Tell me about the Tax implications if I invest in the Quantum Gold Savings Fund. Taxation of Mutual Funds in India can be divided in two parts Capital Gains & Dividends.